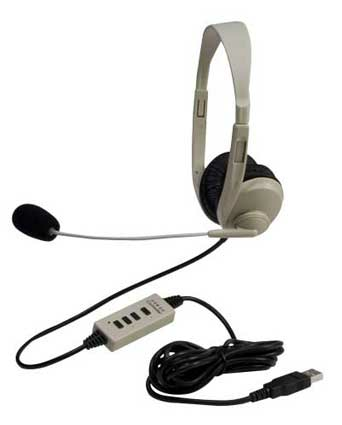 The Multimedia Stereo Headset is versatile and comfortable enough to be used for a variety of digital classroom uses, in computer lab settings, for online assessments and ELA testing (to meet Common Core State Standards), literacy and language learning situations. Its lightweight design makes it a natural choice for wearing during extended periods of time while its ABS plastic earcups won't shatter into potentially dangerous shards (unlike consumer electronics items), giving the 3064 series the ruggedness and durability schools need. The windscreen protecting the microphone reduces external sounds during recordings, making the 3064 also ideal for Skype sessions, gaming and other multimedia uses. Noise-reducing earcups resting on the ears provide enhanced protection (compared to earbuds) against ambient noise so students won't need to increase the volume in order to hear the content. The entry point of the cord into the earcup is reinforced against accidental pullout and has in-line volume control for individual preferences (3064-USB and 3064AVBL only). The 3064 series offers connections choices of dual 3.5mm stereo plugs or a USB plug. The optional USB connection allows faster access to media files and streaming audio files and also includes mute, mic on/off. Optional disposable hypoallergenic cloth earpad covers (3060EC) are available for 3064 headsets in high use settings. Students and teachers tell us the covers help make the headsets feel even cooler, are comfortable to wear and help keep the earpads clean. The Multimedia Stereo Headset is available individually, in a school 10-pack with USB plugs with a foam-lined storage case (3064USB-10) and as a school 10-pack with dual 3.5mm plugs without a storage case (3064AV-10L). Our highest quality stereo headphones For music theory/appreciation classes and ear training Replaceable over-the-ear fitting leatherette cushions On-ear ambient noise-reducing earcups help diminish exterior sounds. This reduces the need to increase the volume (protecting the ears) and helps keep students on task. This headset has multiple plug choices to fit a variety of devices. Make sure your selected headset has the right compatible plug to fit the intended audio source.